WROCLAW, POLAND - What if one day all buildings could be equipped with windows and facades that satisfy the structure’s every energy need, whether rain or shine? That sustainability dream is today one step closer to becoming a reality thanks to Polish physicist and businesswoman Olga Malinkiewicz. The 36-year-old has developed a novel inkjet processing method for perovskites — minerals for a new generation of cheaper solar cells — that makes it possible to produce solar panels under lower temperatures, thus sharply reducing costs. Indeed, perovskite technology is on track to revolutionize access to solar power for all, given its surprising physical properties, some experts say. “In our opinion, perovskite solar cells have the potential to address the world energy poverty,” said Mohammad Khaja Nazeeruddin, a professor at Switzerland’s Federal Institute of Technology Lausanne, an institution on the cutting edge of solar energy research. Solar panels coated with the mineral are light, flexible, efficient, inexpensive and come in varying hues and degrees of transparency. They can easily be affixed to almost any surface — laptop, car, drone, spacecraft, building — to produce electricity, including in the shade or indoors. Though the excitement is new, the mineral perovskite has been known to science since at least the 1830s, when it was identified by the German mineralogist Gustav Rose while prospecting in the Ural Mountains. It was named after the Russian mineralogist Lev Perovski. In the following decades, synthesizing the atomic structure of perovskite became easier. But it was not until 2009 that the Japanese researcher Tsutomu Miyasaka discovered that the perovskite class of minerals can be used to form photovoltaic solar cells. Initially the process was complicated and required ultra high temperatures, so only materials that could withstand extreme heat — like glass — could be coated with perovskite cells. This is where Malinkiewicz comes in. In 2013, while still a Ph.D. student at the University of Valencia in Spain, she figured out a way to coat flexible foil with perovskites using an evaporation method. Later, she developed an inkjet printing procedure that lowered production costs enough to make mass production economically feasible. “That was a bull’s-eye. Now high temperatures are no longer required to coat things with a photovoltaic layer,” Malinkiewicz said. Her discovery quickly earned her an article in the journal Nature and media attention, as well as the Photonics21 Student Innovation award in a competition organized by the European Commission. The Polish edition of the MIT Technology Review also selected her as one of its Innovators Under 35 in 2015. She went on to cofound the company Saule Technologies — named after the Baltic goddess of the sun — along with two Polish businessmen. They had to assemble all their laboratory equipment from scratch, before multimillionaire Japanese investor Hideo Sawada came on board. The company now has an ultramodern laboratory with an international team of young experts and is building an industrial-scale production site. Eventually, compact production lines could easily be installed everywhere, according to demand, to manufacture perovskite solar panels that are made to measure. The Swedish construction group Skanska is testing the cutting-edge panels on the facade of one of its buildings in Warsaw. It also inked a licensing partnership with Saule in December for the exclusive right to incorporate the company’s solar cell technology in its projects in Europe, the United States and Canada. “Perovskite technology is bringing us closer to the goal of energy self-sufficient buildings,” said Adam Targowski, sustainability manager at Skanska. “Perovskites have proven successful even on surfaces that receive little sunlight. We can apply them pretty much everywhere,” he said. A standard panel of around 1.3 square meters, at a projected cost of €50 ($57), would supply a day’s worth of energy to an office workstation, according to current estimates. Malinkiewicz insists that the initial cost of her products will be comparable to conventional solar panels. Perovskite technology is also being tested on a hotel near Nagasaki. 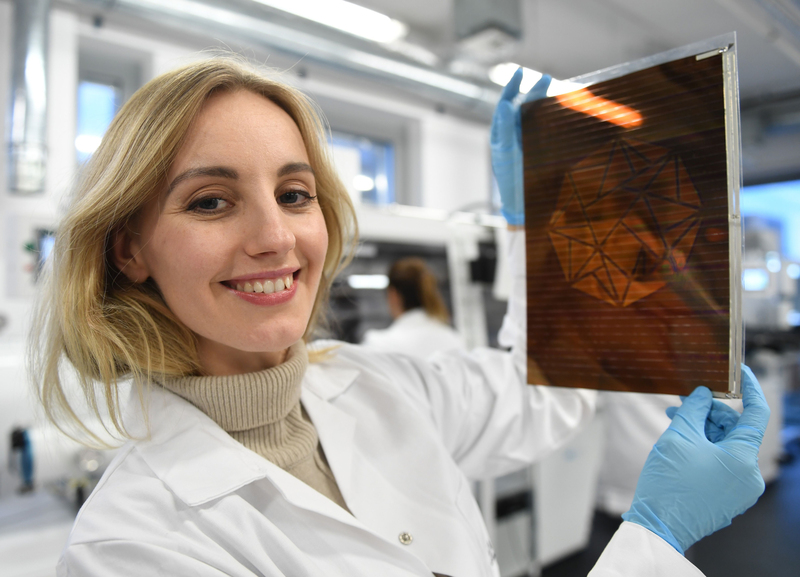 Plans are also afoot for the pilot production of perovskite panels in Valais, Switzerland, and in Germany under the wings of the Oxford Photovoltaics venture. “The potential of the technology is clearly enormous,” said Assaad Razzouk, the CEO of Singapore-based Sindicatum Rewable Energy, a developer and operator of clean energy projects in Asia. Hundreds of Muslim refugees in western Sri Lanka have taken refuge in mosques and a police station after facing intimidation following the deadly Easter bombings, activists said Thursday.